Authentication, Cloud, Cyber, IT or Secure ID Solution? Infrastructure, Physical Security, Public Sector or Safety Solution? Please Join Us "In The Boardroom"
As a leading security solutions portal, our community offers your company an excellent business development opportunity. Based on our demographics, our channel offers your company an excellent awareness, branding and lead generation opportunity in your target markets. We are B2B, B2Government, B2Finance, B2C and our channel reaches your target markets and customers. 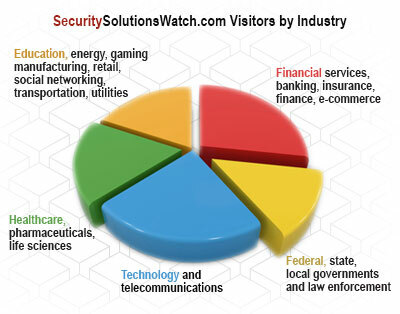 Please visit Google to see our top rankings first hand for Physical Security Solutions and Secure ID Solutions. Our traffic = 550,000 page views per month, 240,000 unique ISPs per month. Most importantly, please see the Job Titles of our website visitors. I believe you will see that these professionals represent the customers, "deciders", and "influencers" that you would like to reach. Please let me know if you have any questions or require any additional information. I would be happy to give you a quick tour and show you exactly how your brand will be featured.